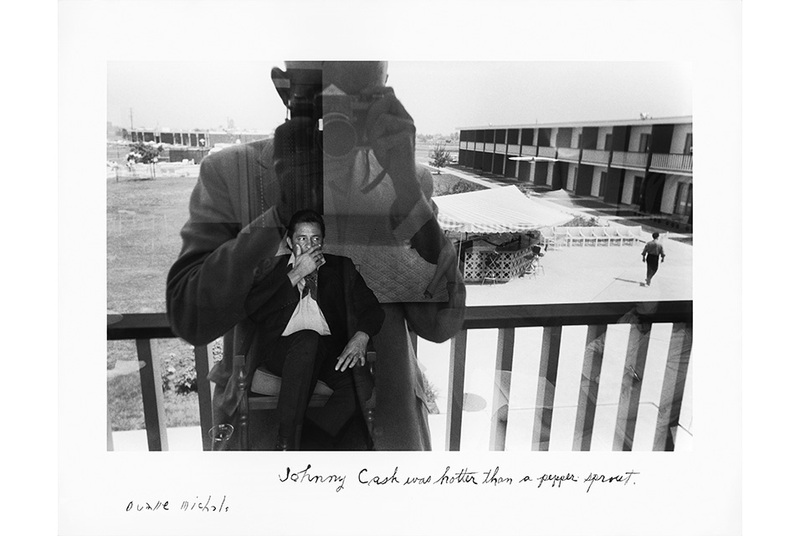 Duane Michals, Johnny Cash, c. 1970s. Gelatin silver print with hand-applied text, edition 2/5, 6 5/8 x 9 15/16 in. © 2018 Duane Michals Courtesy of DC Moore Gallery, New York. SACRAMENTO, CA.- The Crocker Art Museum announced the opening of Duane Michals: The Portraitist, the first exhibition to provide a comprehensive overview of inventive portraits by the influential photographer who, in the 1960s, broke away from established documentary and fine-art photography traditions, and is still creating original work today. Spanning Michalss 60-year career, the exhibition features more than 125 portraits of American luminaries as well as anonymous individuals, family members, and friends. Many of the images are black-and-white photographs recently rediscovered by the artist in his New York apartment. The exhibition highlights the artists stylistically varied body of work through portraits that demonstrate his expansive toolkit  sequenced images, multiple exposures, reflections, uncommon vantage points, collage, hand-painting, and other techniques. Michals often employed these methods to the work he did as an editorial photographer for major periodicals including Esquire, Life, Mademoiselle, and Vogue. On his images he often adds handwritten annotations that convey a contemplative tone. Subjects as diverse as Canadian songwriter Leonard Cohen, Norwegian actress Liv Ullman, Japanese artist Yayoi Kusama, actress Meryl Streep, novelist Philip Roth, actor Robin Williams, the original cast of Saturday Night Live, and many more, are shown together for the first time in this exhibition. Other highlights include engaging portraits of Maya Angelou, Robert De Niro, Marcel Duchamp, Stephen King, Eartha Kitt, Madonna, Liza Minnelli, Yves Saint Laurent, Sting, Barbra Streisand, Andy Warhol, Tennessee Williams, and Sacramentos own literary treasure Joan Didion. As the variety of poses, settings, viewpoints, and formats in these images demonstrate, Michals adapts the style of each portrait to the individual, thereby ensuring that the photographs are as much about the sitter as the photographer. Born in 1932 in McKeesport, Pennsylvania, Michals earned a Bachelor of Arts from the University of Denver in 1953, then spent two years in the Army followed by studies at Parsons School of Design in New York City. His earliest major solo museum exhibitions were at the Art Institute of Chicago in 1968 and the Museum of Modern Art, New York, in 1970. Since then, he has had numerous solo shows, including at the Odakyu Museum, Tokyo (1999), the International Center of Photography, New York (2005), the Thessaloniki Museum of Photography, Greece (2008), and the Scavi Scaligeri in Verona, Italy (2008). His work is located in numerous permanent collections in the U.S. and around the world. Michals lives in New York City. Michals disrupts expectations with handwritten annotations that express his impressions of a person via witty word play or poetic commentary. Johnny Cash was hotter than a pepper sprout, for instance, is scrawled across the bottom of the legendary musicians portrait. On a work titled Annas Old Clothes, Michals writes a poignant prose poem describing how his grandmother still comforts him, even as her body lies lifeless: She has taken her body off as she would her clothes at bedtime.